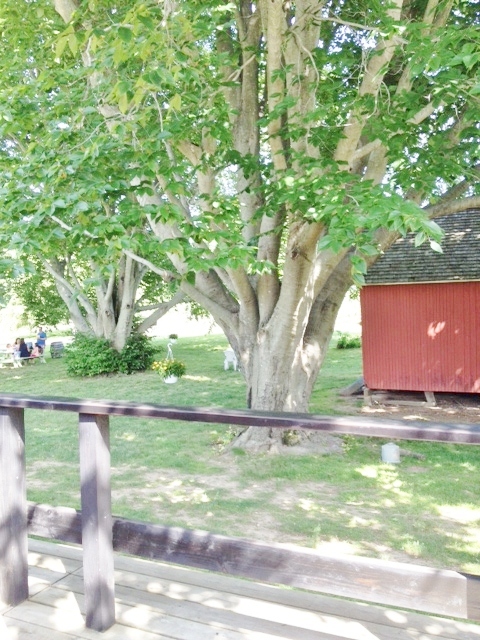 The Old Field is a great place for photos, with lots of scenic farm buildings. Appropriately, The Old Field’s history matches its appealingly rustic look. 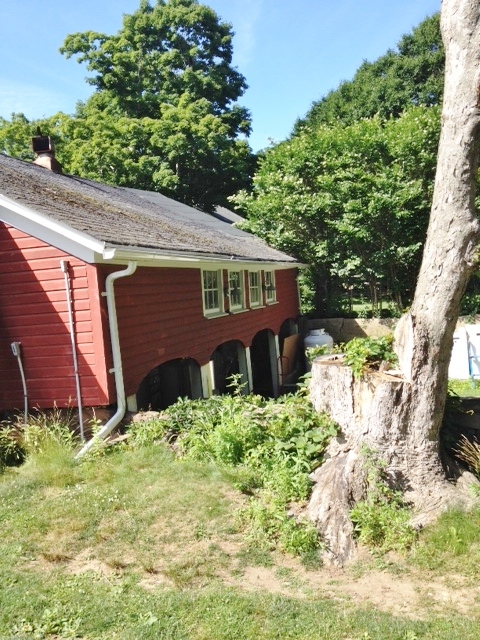 It can trace its roots as a farm back to the mid-1600s, when the land was bought from the Native Americans, according to its web site, and that’s not its only connection to history, about which more later. 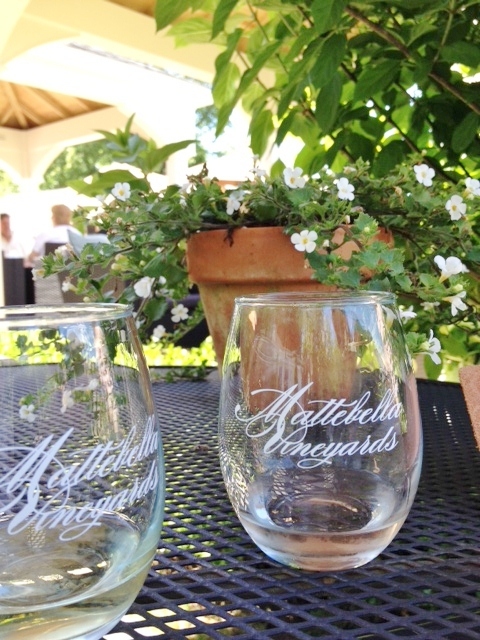 We particularly enjoy coming here in the warm weather, when you can stand outside at the tasting bar or sit at a picnic table and enjoy the sight of ducks and chickens running around (the pair of ducks, by the way, are named Fred and Ethel, but I don’t know if their last name is Mertz), scenic old farm buildings, and the vineyards. One of the owners is usually on hand as well, if you want to get into a deep discussion of the wines. 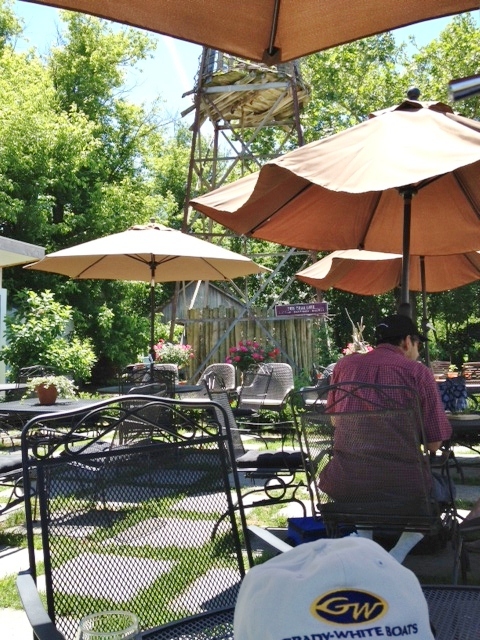 The overall vibe is relaxed and congenial, and we’ve often found ourselves conversing amiably with strangers as we sip. 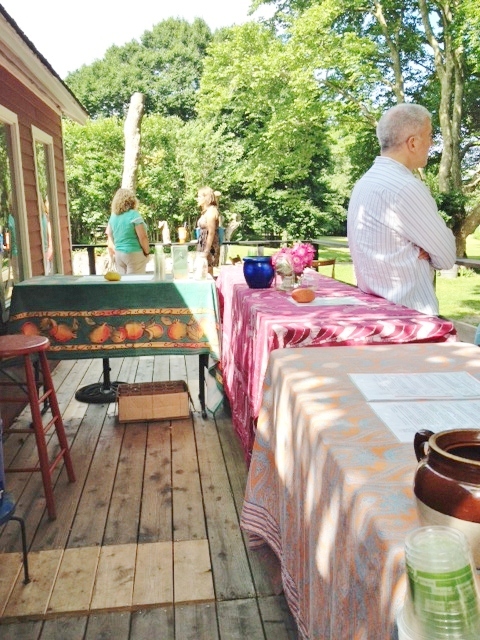 The tasting bar, with its charmingly mismatched tablecloths. The tasting menu offers three options: A tasting of whites, four for $6; reds, three for $5; or a mixed group, four for $6. They also offer wines by the glass—in which case you get an actual glass, rather than the somewhat unfortunate little plastic cup used for tastings—and the bottle, which we noted a group of picnickers enjoying. We decide to share a white and a red, so as to sample all their wares. The only thing we don’t like here: the plastic cups. Our youthful and enthusiastic server informs us that this is a new release, a very light pink rosé made from pinot noir grapes. 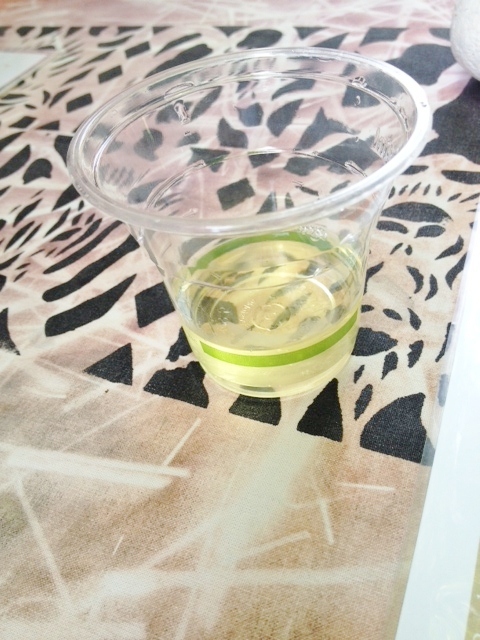 It is so light that it looks like a white wine in the glass. The aroma is mineral, with a touch of cut grass. Very summery and pleasant, with only a little strawberry flavor, this is a nice summer drink I’d serve well iced. $1 of the purchase price of every bottle sold goes to support an animal shelter. Although this is primarily a steel-fermented chardonnay, a short time in oak gives it a bit of a vanilla aroma, along with what they describe as a “wet slate” smell. If you’ve ever walked around Manhattan while the doormen are hosing off the warm concrete in front of their buildings you know the smell. This is also a light wine, quite tart, with lots of lemon and grapefruit. It would pair nicely with a tarragon chicken salad. After six months in oak, this Chard has definite vanilla and burnt caramel aromas, and lots of pineapple taste, but is not too oaky. Good picnic wine. A blend of Merlot and Cabernet Franc, this is their everyday pasta and pizza wine, and it is a good member of that club, dry, with some dark fruit tastes. Their ‘09 Cabernet Franc, by the way, has sold out. Not much aroma, berry and cinnamon tastes, fairly light for a red: we decide the Merlot is just okay. Really? 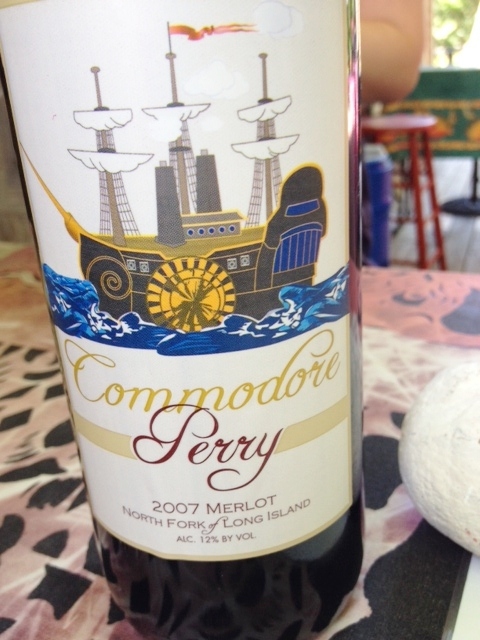 Commodore Perry? What’s that about? Wasn’t he the guy who opened up trade with Japan? And why is there a somewhat Japanese-looking sea under that ship on the label? Here’s the other link to history I mentioned earlier. 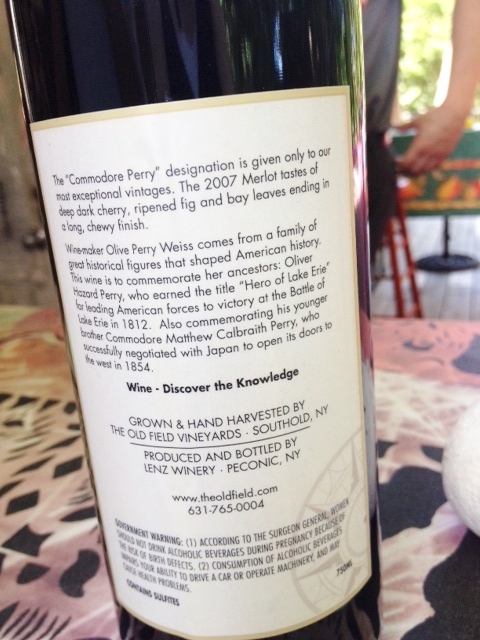 Commodore Perry is indeed an ancestor of the family who owns the vineyard, and so they honor him by only naming their best vintages after him. ’07 was a great year, and this Merlot shows it, with lots of flavors of dark fruit and ripe figs plus good tannins. We buy a bottle, planning to cellar it. We are also entertained to learn that this wine is famous in Japan, due to the name, and that Japanese tourists get very excited when they come to Old Field and see it. In fact, one was so intrigued that he offered to design the label! 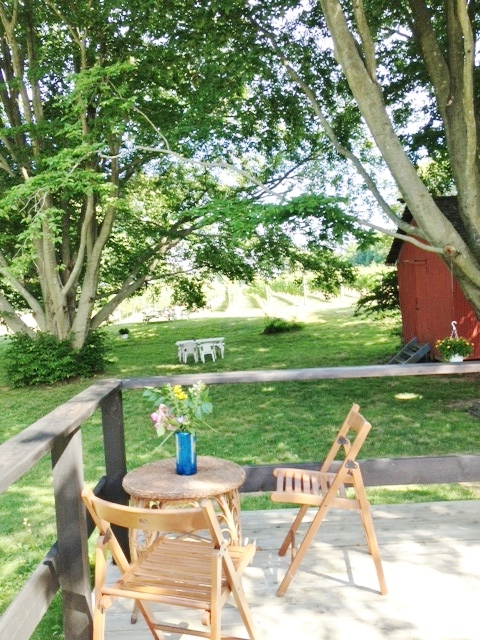 Reasons to visit: pleasant rustic setting, with picnic tables and roaming fowl; the 2012 Barrel Fermented Chardonnay; the Cacklin’ Rosé; the ’07 Commodore Perry; the chance to hear stories about the history of the farm (including one cold winter day when we heard all about the resident ghosts). The labels feature this charming picture of Matt and Isabella. 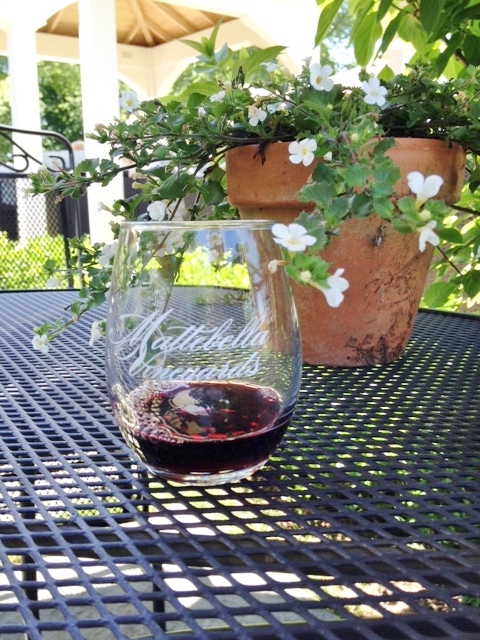 The warm greeting you get as you enter Mattebella Vineyards’ pretty patio is only one aspect of the family feeling this winery exudes, starting with the name. Matt and Isabella are the children of owners Christine and Mark Tobin, and you are likely to see the whole family helping out with tastings and other chores around the property. You’ll recognize the kids by their portraits on the bottles, though they have grown older since the pictures were drawn. Regulars are greeted with a kiss by Chris, but even newcomers soon feel at home. 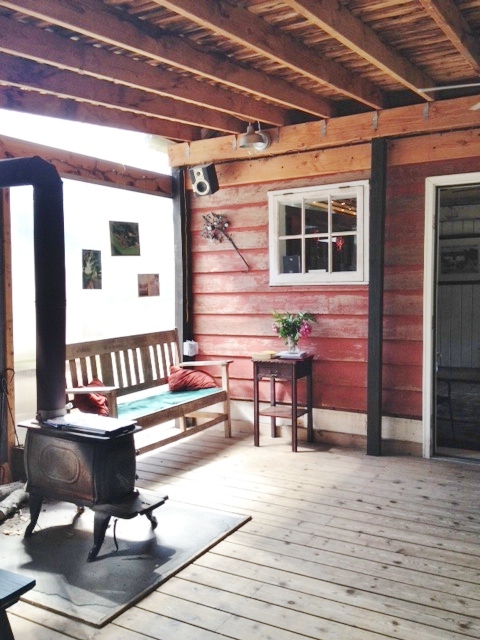 On our visit, we overheard Mark giving excellent advice about places to eat and sights to see to a young couple on their first trip to the North Fork. She, by the way, was enjoying their home made organic lemonade, as she was in that interesting condition in which women are encouraged not to drink. 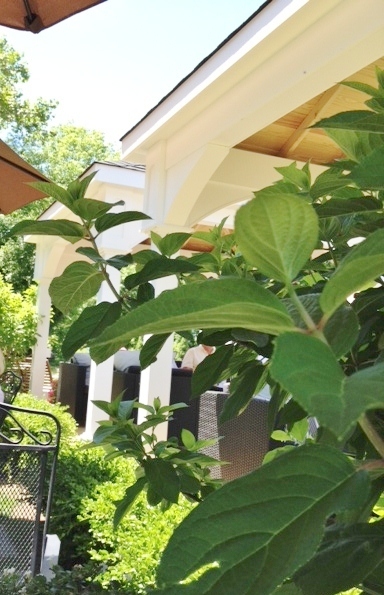 The patio has been improved in the two years since our last visit, with plenty of comfortable seating and a combination of sunny and shaded areas, including under a lovely pergola, with pleasant music playing in the background. The tasting menu is divided into a “Light” flight and a red flight, with tastes also available individually for about $2 for the lights and $4-5 for the reds, or by the glass or bottle. A Light Flight is $12 for 6 of their whites and rosés (4 chardonnays and 2 rosés), and a Red Flight is $18 for 5 reds. We opted to share one Red Flight plus two individual wines from the Lights. They also sell their attractive round-bottomed glasses for $3.50. If you like sweet rosés, this one is not for you, but if you appreciate a delicate and refreshing rosé with a citrus tang and plenty of minerality, then head to Mattebella forthwith. We decided it would go well with soft shell crab, a delicious sample of which we had had the night before at the North Fork Table and Inn, where we went to celebrate our anniversary. The rose and the chardonnay. Our knowledgeable and efficient server explained that the term “reserve” actually has no established meaning, but at Mattebella it indicates a wine from one of their best years. This is a 50% oak barrel, 50% steel fermented chard, which means it should not be overly oaky, but we found it pretty oaky, with lots of vanilla and roasted pear aromas and tastes. For the price, it is quite good, with some nice complexity. It might go with a seafood in cream sauce dish. No vintage here, this is a blend, trying for consistency across the years, and, said our server, is a “good pizza wine.” We agree. It is a pleasant, soft drink, not complex, but with nice fruit and none of the earthy flavor reds sometimes have out here. It’s a blend of merlot and cabernet franc, so sort of Bordeaux-ish. Oh, and we get a clean glass for the transition to the reds. 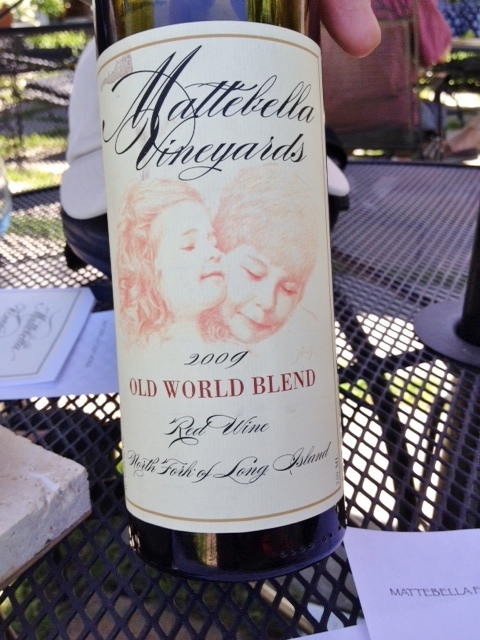 In this instance, Old World Blend means merlot, cabernet sauvignon, and cabernet franc—a Bordeaux. This, says our server, is the lightest of the OWBs, because there was a lot of rain at the end of the season. Along with our glass of wine we get a little snack (I remember Chris saying the last time that we were there that she felt wine should always go with food.) 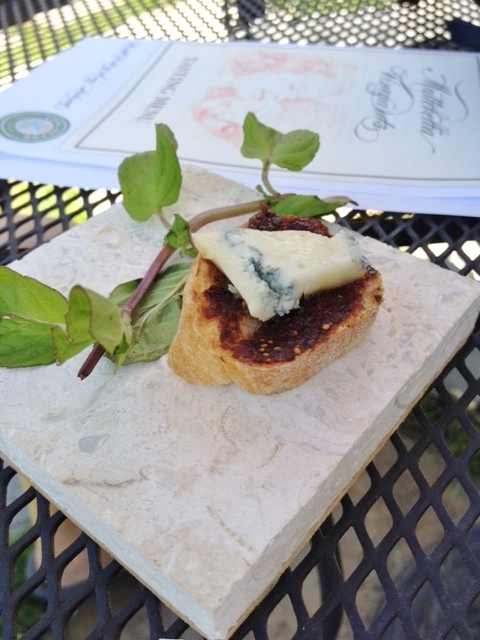 of a piece of baguette topped with fig jam and blue cheese. We like the snack better than the wine, which is just okay. This time the snack is bacon jam and Parmeggiano Reggiano on a baguette—very yummy—and so is the wine, our favorite of the day (and not just because it came with bacon jam, though maybe…). A blend of merlot, cabernet sauvignon, cabernet franc, and “the grape no one knows,” petit verdot, the wine has good tannins and lots of dark fruits, and is interestingly complex. Our server says this is his favorite of the reds, and talks about a certain “brininess,” which he feels expresses the Long Island terroir, its closeness to the sea. We get it—there is a hint of a sea salt taste. This would work well with a nice dinner, maybe of boeuf bourguignon. The tasting notes suggest this will age well. A blend of the same grapes as the 08, this is the wine that won a Wine Spectator 91 points. 07 was a particularly good—and warm—year on Long Island, and this one has lots of big bold fruity tastes, more like a Napa Valley red. We smell leather and spice, and maybe, strangely enough, a hint of cat pee. 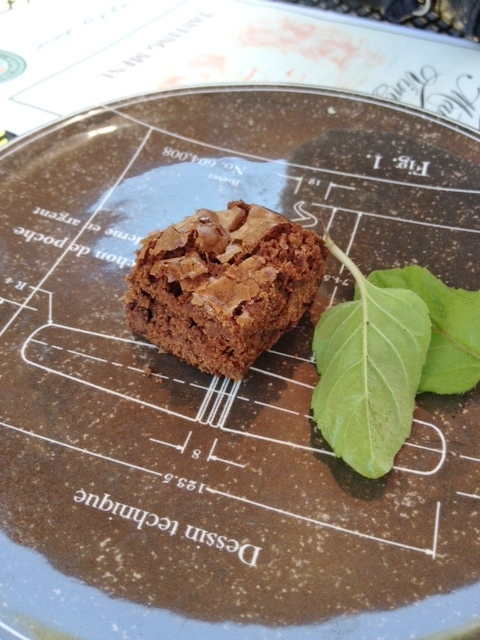 Since the Tobins have decided that this wine would go well with chocolate, we get a tiny square of homemade chocolate brownie. Lovely way to end our tasting! The brownie went well with the red wine. Reasons to Visit: Snacks! 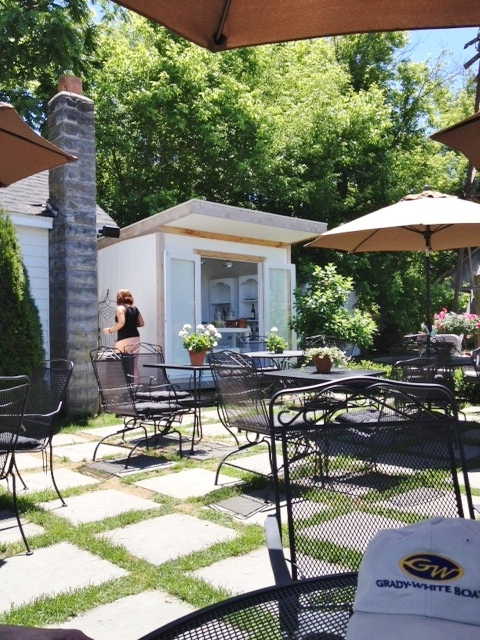 ; pleasant outdoor space for sipping; warm welcoming family atmosphere; the 2013 Rosé, the Famiglia, the 09 and 07 Old World Blends; homemade lemonade for the non-drinkers in the group. We go home with two bottles of the Famiglia and one of the 09 OWB. An old water tower adds charm to the scene.